The advent of the internet and social media has predominantly changed the marketing landscape and the way we buy things. Roadside billboards have been transferred to our computer screens. Street peddlers have been replaced by Buy buttons. And brick and mortar stores have been succeeded by virtual ones that exist only on the Internet. However, the means on how to reach our customers have not changed significantly. We still utilize sound, images, text, and a combination of those. But one form remains supreme of them all – video content. Just as television becomes the go-to for marketers when it was first invented, video content benefited greatly from the creation of video streaming websites such as YouTube, as well as from the dawn of social media. Videos are combinations of movement and noise and therefore appeal to us visually and audibly. Our brain retains more information if it came via a moving image rather than a written set of text. On any given day, we remember 95% of the message when we watched it, and only 10% when we read it. Movement and noise appeal to our basic emotions. Written text was first invented 3,000 to 4,000 years ago, when we already developed a sophisticated mind. The letter and symbols appeal only to the more superficial part of the brain. Spoken language came earlier, as early as 40,000 years ago. Here, articulated words and stories ignited our imagination, but still required a lot of mental gymnastics from our still-developing brain. A hundred thousand years ago, is when our brains are in most basic and primitive form when we operate more on instinct rather than logic. Here, we get information from whatever nature throws at us. The view and the roar of an approaching lion, the spectacle of a lightning combined with loud cracks of thunder, or the sight of an erupting volcano, and the boom that goes with it. For a much longer time in our existence, we relied on narratives told through visual and auditory cues to make sense of the world around us. Fast-forward to the 21st century, nothing changes much. We might be living in modern times, but we still operate on the emotional and sensory repertoire that was formed during our ancestors’ cave dwelling days. This is why videos captivate better us rather than sound alone or text alone. It appeals to our base emotions, pushing aside logic and reasoning. And marketing is all about getting hold of your customer emotionally. a) Will the content drive traffic your website? b) Will the audience find the content unobtrusive? c) Will the content reach the audience wherever they are? If video is your choice of content, then it’s a “YES” for all of these. Let’s examine. First, video comes on top when it comes to SEO. Companies that utilize videos on their websites have a staggering 41% more web traffic from searches compared to companies that don’t use it at all. Not to mention, organic traffic drives up by 157% by following the same strategy. Search engines are ranking videos higher than they used to. When your audience shares the video or link back to your page, an inbound link is created, which drives your ranking up in search engines. 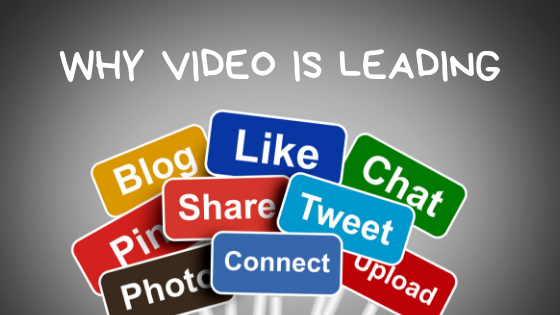 Additionally, embedding videos on your landing page propel conversions by up to 80%. Second, People loooove videos. We cannot exaggerate that enough. As we have mentioned above, it is the most engaging medium out there, and the numbers do not lie either. Your audience is more likely to click on an online video 27 times over a static banner ad. And if that isn’t impressive enough, videos are also more likely to be shared by 1,200% compared to text and images combined. Shares, likes, traffic, brand recall, and awareness are all important milestones of marketing, but at the end of these lies the most important aspect – conversion. Businesses thrive on sales, not followers or subscribers. It is the be-all and end-all of marketing efforts. And video content does a good job of driving this element up. Latest research shows that 90% of customers claim that product videos assisted them in making buying decisions. Likewise, potential buyers are 64% more likely to purchase a product online after watching a video about it. Two fascinating cases studies of this phenomena: StacksAndStacks.com, an organizational housewares online retailer, disclosed that their visitors are 144% more likely to buy their products upon seeing a product video over those who did not. Meanwhile, Advance Auto Parts, a car parts retailer, reported that placing instructional and how-to videos both on their site and Facebook page made their visitors stay on the site twice as long and visit twice as many pages, which leads to more sales for them. Videos make your products shine, answer your audience’s question, and make them stay longer on your website, further guiding them to make a buying decision. And more importantly, video contents increase trust in your audience’s part, which is a vital factor in making a sale. Watching your video gives them a good understanding of your business, who are the people running it, how the product works, what are its features, and the other unseen benefits that come with it. A long string of text and a bunch of images cannot deliver this information as effectively as videos can. Consequently, this process helps them make informed decisions. Needless to say, these days. Our brains respond more to it. The current channels of communication favor it more. And the results are undeniable. It is a must in all content marketing plans. Use it correctly and see the gains you’ve never seen before. Ignore it and you’ll have losses you can never acquire back anymore.